The cause of the explosions was not immediately known, but an investigation concluded in February 2016 that an overheated container of dry nitrocellulose was the cause of the initial explosion. The final casualty report was 165 deaths, 8 missing, and 798 non-fatal injuries. Tianjin Dongjiang Port Ruihai International Logistics (天津东疆保税港区瑞海国际物流有限公司), or Ruihai Logistics (瑞海物流), is a privately held logistics company established in 2011. It handles hazardous chemicals within the Port of Tianjin, such as flammable & corrosive substances, oxidizing agents, and toxic chemicals. The company, which employed 70, is designated by the Tianjin Maritime Safety Administration (天津海事局) as an approved agent for handling these hazardous chemicals at the port, and its operating license was renewed two months prior to the explosions. Its 46,000-square-metre (500,000 sq ft) site contains multiple warehouses for hazardous goods, a fire pump and a fire pond. The warehouse building, owned by Ruihai Logistics, is recorded in a 2014 government document as being a hazardous chemical storage facility for calcium carbide, sodium nitrate, and potassium nitrate. Safety regulations requiring that public buildings and facilities should be at least 1 kilometre away were not followed, and local inhabitants were unaware of the danger. The authorities stated that poor record keeping, damage to the office facilities and "major discrepancies" with customs meant that they were unable to identify the substances stored. State media revealed that Ruihai had only received its authorisation to handle dangerous chemicals less than two months earlier, meaning that it had been operating illegally from October 2014, when its temporary license had expired, to June 2015. At around 23:30 (15:30 UTC), the first explosion occurred and registered as a magnitude 2.3 earthquake, generating seismic shock-waves energetically equivalent to 2.9 tonnes of TNT. After 30 seconds, a second, much more powerful explosion occurred, causing most of the damage and injuries with shock-waves felt many kilometres away. The second explosion registered as a magnitude 2.9 earthquake and generated seismic shock-waves with energy equivalent to 21.9 tonnes of TNT. The resulting fireballs reached hundreds of meters in height. Around 23:40 (15:40 UTC) on 15 August, a series of eight smaller explosions occurred in the port as fire from the original blasts continued to spread. The total energy release was equivalent to 28 tonnes of TNT, or 100GJ. The explosion was large enough to be photographed by Himawari, a geostationary meteorological satellite operated by the Japan Meteorological Agency (JMA). Chinese scientists subsequently estimated that the second more powerful explosion involved the detonation of about 800 tonnes of ammonium nitrate, based on crater size and lethality radius (336 tons TNT equivalent, based on relative effectiveness factor of 0.42). One month after the explosion, official reports listed 173 deaths and 797 injuries. Media reported the area to be densely populated, with around 5,600 families living within 1.5 km radius of the plant, the closest being only 600 m away. Neither the developers nor the buyers were aware of the latent dangers of the activities at the nearby site; developers claimed also to be victims. According to the Tianjin government, more than 700 people were injured by the explosion, many with extensive injuries, mostly from burns and explosive blast injuries. Over a thousand firefighters were on scene, and 95 were killed. One surviving firefighter, a 19-year-old named Zhou Ti (周倜), was found on the morning of 14 August. The death toll of the incident, which also included 11 police officers, was the worst for Chinese front line responders since the founding of the People's Republic of China in 1949. Photographs and videos showed extensive destruction in and around the warehouse compound, with an enormous crater at the blast site. The buildings of seven more surrounding logistics companies were destroyed, and large quantities of intermodal container stacks were toppled and thrown by the forces of the explosions. More than eight thousand new cars from Hyundai, Kia, Volkswagen, Renault, and Toyota, parked in lots located near the blast site, were largely burned as a result of the initial explosions. Multiple buildings surrounding the blast site were declared "structurally unsafe". In total, 304 buildings, 12,428 cars, and 7,533 intermodal containers were damaged. Beyond insurance, the cost to businesses of the break in the supply chain caused by the explosions was estimated at $9 billion, making it the third most expensive supply chain disruption of 2015. Apartment blocks 2 km (1.2 mi) from the site sustained shattered glass, loss of roof tiles and damage to ceilings – with 17,000 units being affected. Nearby Donghai Road Station suffered severe damage as a result of the explosions and was closed until 2016, as was the rest of Line 9 of the Tianjin Metro beginning on 13 August. A Japanese department store four kilometres away reported damage to walls and ceilings. The explosions also affected the National Supercomputing Center of Tianjin several kilometres away, knocking out windows and causing some internal ceilings to collapse; the center's supercomputer Tianhe-1A itself was not damaged. Ammonium nitrate, which is principally used in manufacturing fertilizer, has been implicated in a number of other fatal industrial explosions. A fire department spokesman confirmed that firefighters had used water in combating the initial fire, which may have led to water being sprayed on calcium carbide, releasing the highly flammable gas acetylene. This would have provided the fuel source for reaction with the oxidiser, ammonium nitrate and consequently detonate. At least 700 tonnes of highly toxic sodium cyanide was stored at the site – 70 times the legal limit. Sodium cyanide leakage was reported in the sewer. On 13 August, sulphur dioxide, carbon monoxide and nitrogen oxides, all of which are toxic, were detected within 500 m (1,600 ft) of the origin of the explosion, but the levels conformed with the national standards. The government maintained that gases were undetectable 2 km (1.2 mi) from the site during initial testing on 14 August. Rain on 25 August 2015 in the Binhai New Area brought more complaints of skin burns from volunteers and journalists. A bright white foam also appeared on the streets. Deng Xiaowen, director of Tianjin's environmental monitoring centre, questionably stated that the foam was "a normal phenomenon when rain falls, and similar things have occurred before". On Thursday morning, the Chinese leaders ordered officers in the city to make full effort in rescuing the injured, and search for those missing. Xi Jinping, the General Secretary of the Communist Party of China and Li Keqiang, the Premier of the People's Republic of China, also said police should investigate the cause of the incident and punish those responsible for the blast. Tianjin officials, initially concerned at public response, announced that 14 people had perished in the explosions, but later raised the death toll to 44 once the scale of the explosions became clear. The South China Morning Post (SCMP) cited a Tianjin police source that officers had been instructed to remove bodies from the scene to deliberately understate the official death toll, which angered the Tianjin government. The morning following the explosion military personnel began to arrive in Tianjin to help with the search and recovery efforts. Extra equipment, such as bulldozers, were brought in to help with the clean-up operation. Over 200 nuclear and biochemical experts, including a team from the International Atomic Energy Agency, began arriving in Tianjin to assess the health risks from the chemicals being released into the atmosphere. Government personnel set up twelve temporary monitoring stations near the blast site with above-normal levels of pollutants being detected. A nearby drainage outlet was also closed, and water quality tested. Firefighting was suspended on the afternoon of 13 August due to the uncertainty of the content and quantity of hazardous materials being stored on site. A team of over 200 chemical specialists was deployed to the site to assess the hazardous materials on site and dangers to the environment, and to determine the best way to put out the remaining fires and proceed with search and rescue and clean-up operations. Later that day, rescue personnel were dispatched in an attempt to remove the 700 tonnes of sodium cyanide believed to be stored at the site, with hydrogen peroxide being prepared to neutralise the chemicals. Daily press conferences were organised. A press conference organised by local officials held on 14 August came to an abrupt end when a journalist began asking questions as to why such dangerous chemicals were stockpiled so close to housing estates. Initially, more than 3,500 area residents were staying in temporary shelters, but the number surpassed six thousand within three days. The government issued an evacuation order over concerns of further explosions; not all residents complied. On 15 August, local authorities ordered the evacuation of residents within a 3 km (1.9 mi) radius of the blast site, prompted by the threat of "toxic substances", including sodium cyanide. Hong Kong media announced that Li Liang, the major shareholder – owning 55%, was the nephew of former chairman of the CPPCC National Committee Li Ruihuan, who had been de facto leader of the Tianjin clique, and that the company may have been named after his brother and Li Liang's father; the remaining 45% was owned by Shu Zheng. Reports in state media one week after the explosion were contradictory, holding that Ruihai was owned via proxies by Yu Xuewei, a former senior executive at Sinochem, and Dong Shexuan, who served as the company's vice-president and had been arrested by police by the time of the reports. Dong Shexuan is the son of Tianjin port's former police chief Dong Peijun, who was a colleague of Wu Changshun, the former chief of the public security bureau of Tianjin. The Central Commission for Discipline Inspection (CCDI), CPC's anti-corruption body, charged Wu Changshun with bribery in 2014; Dong Peijun was also under investigation for corruption, but died that year. After the explosions, the CCDI placed Yang Dongliang, Director of the State Administration of Work Safety and China's highest work-safety official, under investigation on 18 August 2015. Yang had previously served as Tianjin's vice mayor for 11 years. In 2012, Yang Dongliang had issued an order to loosen rules for the handling of hazardous substances, which may have enabled Ruihai to store toxic chemicals such as sodium cyanide. On 27 August, Xinhua reported that police had arrested twelve people with suspected connections to the explosions, including Ruihai Logistics' chairman, vice-chairman, and at least three other managers, with the other seven people unnamed. On 5 February 2016, the Chinese government issued the investigation report of the explosions. The report concluded the fire started in a container through auto-ignition of nitrocellulose, due to vaporization of the wetting agent during hot weather. On 8 November 2016, various courts in China handed jail sentences to 49 government officials and warehouse executives and staffs for their roles circumventing the safety rules that led to the disaster. The Chairman of Ruihai Logistics was sentenced to death with a two-year reprieve. Initially, Tianjin authorities banned editors and reporters from sharing information about the disaster on Weibo and WeChat, and websites were ordered to follow state media. Tianjin Television had reported the explosion on their early morning news at 7:00 am, but citizens complained that the station had not reported live nor updated on the event, instead showing soap operas eight hours later. A great deal of specific information on the event, including the majority of early stage video was first released over social media sites, and in particular microblogging platforms like Weibo. Major media has drawn heavily from social media sources, greatly widening the audience. The Economist noted, "Social media fills in the blanks left by official narratives of the Tianjin disaster. The most remarkable feature of the aftermath of the explosions in Tianjin, in northern China, has been the extraordinary contrast between the official reaction to the crisis, which has been profoundly flawed, and the online reaction, which has entirely dominated the agenda." Professional and social media reports were censored by Chinese authorities. The censorship rate increased tenfold on the social media site Weibo, with users reporting the deletion of their posts regarding the blasts, with "Tianjin" and "explosion" being the most censored words. An article by Caijing, which carried an interview with a firefighter who said that no-one on the front line had been informed of the dangerous chemicals on site that would react exothermically when mixed with water, was deleted after it had been reposted 10,000 times; many other posts mentioning the existence of deadly sodium cyanide were also expunged. The Cyberspace Administration of China banned all journalists from posting to social media, and insisted on strict adherence to Xinhua copy. On 15 August, it announced that it had shut down 18 websites and suspended 32 more for spreading false information. More than 360 Weibo and public WeChat accounts which had allegedly been spreading such false rumors have been "punished according to laws". Of these accounts, over 160 were shut down permanently. Press freedom organization Reporters Without Borders (RSF) accused the Chinese state media of playing up the heroic efforts of rescue workers and firefighters while downplaying the causes of the explosions and the number of casualties. RSF said that censorship by the Chinese authorities showed "a flagrant indifference to the public's legitimate concerns". Immediately following the blasts the company website was taken down fuelling suspicions that an attempt was being made to shield owners with powerful political connections. For several successive days, local residents seeking compensation for their homes protested in front of the venue of the daily press conference, they were joined by distraught families of missing firefighters, and confronted police angrily. The Chinese public security minister threatened severe punishment for those found to be responsible for the explosions. However, the authorities did not release any significant information for several days about the chemicals and circumstances, causing public anger to mount during this time. Marking an official change of tack that suggested top-level endorsement, the official People's Daily joined in to criticise local officials' lack of candour and their use of bureaucratic jargon. In addition, the Global Times remarked on the inadequacy of emergency response and the reluctance of high-ranking officials to answer the public's questions and address their concerns until four days after the blasts. The People's Daily acknowledged that public scepticism of the reported death toll was fuelling rampant rumours; there was also disquiet over the emergency assistance provided and the way the aftermath was being handled. Attempting to defuse widespread anger at the lack of official transparency, mouthpieces of the ruling party declared that investigations would be thorough and transparent. Former deputy mayor, Yang Dongliang, was put under investigation for corruption; mayor Huang Xingguo proclaimed his "unshirkable responsibility for this accident". Authorities also released information about the ownership of Ruihai, as well as a confession by one beneficial owner for the proxy shareholdings. Observers stated that top officials always attempt to show such disasters as isolated instances, have never accepted political accountability nor addressed the underlying governance issues, and have always heavily censored any criticism of the central government. Willy Lam, professor at CUHK and senior fellow at The Jamestown Foundation, noted the highly unusual 4 days it took for Li Keqiang to make an official visit, suggesting that the lack of a top-ranking visitor to a major disaster site within 48 hours despite the proximity to Beijing reflected "division among the leadership on who should be the fall guy." Tianjin officials announced that as at the deadline on 3 September 2015, more than 9,000 households out of some 17,000 affected by the explosions had signed agreements to settle their damages claims. It was reported that some had chosen to sell their damaged apartments to private developers, who offered them around 130% of the original purchase price, while others accepted an offer from the local government promising to fix the damaged apartments. The local government offered an additional of ¥20,000 renminbi ($3,100) to those who agreed to settle their claims by the deadline. New York Times journalists, however, reported that some owners had faced heavy pressure from government officials to settle; similarly, owners who were employees in state-owned enterprises were under threat of dismissal from their bosses for not settling. On 10 September 2015 China Daily reported that families of the firefighters killed in the explosions would each receive compensation of 2.3 million yuan (US$360,669), citing a report in Beijing News. It was also reported that a monument would be built on the site and that the government planned to compensate residents whose houses were damaged by repurchasing them at 1.3 times their purchase price. ^ a b "Tianjin blast probe suggests action against 123 people". Xinhua News Agency. 5 February 2016. Retrieved 5 February 2016. ^ "Huge explosions in China's Tianjin port area kill 17, hurt 400". Yahoo! News. 13 August 2015. Archived from the original on 14 September 2015. Retrieved 13 August 2015. ^ a b "China blasts: Casualties as Tianjin shipment blows up". BBC News. 12 August 2015. Retrieved 12 August 2015. ^ a b Huang, Ping; Zhang, Jingyuan (2015). "Facts related to August 12, 2015 explosion accident in Tianjin, China". Process Safety Progress. 34 (4): 313–314. doi:10.1002/prs.11789. ^ "天津爆炸企业"瑞海物流"是个什么公司？". The Beijing News (in Chinese). 13 August 2015. Archived from the original on 14 September 2015. Retrieved 13 August 2015. ^ a b c d e f "大爆炸倉庫違規經營 老闆是李瑞環姪 – 蘋果日報 – 要聞港聞 – 20150815". Apple Daily (in Chinese). 15 August 2015. Retrieved 16 August 2015. ^ "关于瑞海-天津东疆保税港区瑞海国际物流有限公司" (in Chinese). Tianjin Dongjiang Port Ruihai International Logistics. Archived from the original on 14 August 2015. Retrieved 14 August 2015. ^ a b "天津爆炸：消防员未被告知不能用水灭火". Southern Weekly. 13 August 2015. Archived from the original on 13 August 2015. Retrieved 13 August 2015. ^ a b c d "Tianjin blasts: Another of China's 'profound lessons'". CNN. 17 August 2015. Retrieved 17 August 2015. ^ a b Shanglin, Luan (14 August 2015). "Chemicals at blasted warehouse not yet determined: authorities" (in Chinese). Xinhua News Agency. Retrieved 14 August 2015. ^ "Doubts surround Tianjin logistics company after massive blasts". Xinhua News Agency. 18 August 2015. Retrieved 18 August 2015. ^ a b c Ryan, Fergus (18 August 2015). "Tianjin explosions: warehouse 'handled toxic chemicals without licence' – reports". The Guardian. Retrieved 18 August 2015. ^ "China explosions: Tianjin blasts 'on seismic scale'". BBC News. 13 August 2015. Retrieved 5 January 2017. ^ "China explosions: Tianjin blasts 'on seismic scale'". BBC News. 13 August 2015. Retrieved 18 March 2016. ^ "Death toll in China's Tianjin explosion rises to 50: Reports". CNBC. 13 August 2015. Retrieved 19 August 2016. ^ "China explosions: What we know about what happened in Tianjin". BBC News. BBC. 17 August 2015. Retrieved 19 August 2016. 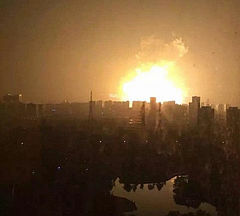 ^ "Huge explosion in Chinese port city of Tianjin". The Guardian. 12 August 2015. Retrieved 12 August 2015. ^ "Winds change at Tianjin blast site, chemicals spread". eCNA. Reuters and Agence France-Presse. 15 August 2015. Retrieved 15 August 2015. ^ Huey Fern Tay (15 August 2015). "China explosions: New blasts hampering search in Tianjin as residents evacuated over chemical fears". Australian Broadcasting Corporation. Reuters. Retrieved 15 August 2015. ^ a b Julia Glum (15 August 2015). "Tianjin 'A Ghost Town' After Explosions, Evacuations Amid Concern Over Chemicals in Air". International Business Times. Retrieved 15 August 2015. ^ "Tianjin explosions visible from space". The Guardian. 13 August 2015. Retrieved 13 August 2015. ^ "Tianjin explosion: China sets final death toll at 173, ending search for survivors". The Guardian. Associated Press. 12 September 2015. Retrieved 14 September 2015. ^ a b "天津滨海新区爆炸事发地居民：希望政府回购房屋". guancha.cn. Archived from the original on 12 September 2015. ^ a b "Death Toll in Chinese Fire Rises, Along With Anger at Apparent Safety Lapses". The New York Times. 14 August 2015. Retrieved 14 August 2015. ^ "Update 10-Huge blasts at Chinese port kill 50, injure more than 700". Reuters. 13 August 2015. Retrieved 13 August 2015. ^ "155位"8–12"事故遇难者身份公开". Sohu News (in Chinese). 2 September 2015. Archived from the original on 14 September 2015. Retrieved 2 September 2015. ^ "天津滨海爆炸事故遇难人数升至159人" (in Chinese). Sina Corp. 2 September 2015. Retrieved 2 September 2015. ^ a b c Ryan, Fergus; Phillips, Tom (14 August 2015). "China blasts: thousands seek refuge as Tianjin explosions death toll reaches 55". The Guardian. Retrieved 14 August 2015. ^ Makinen, Julie (15 August 2015). "Amid new explosions and fires at site of Chinese blasts, there is confusion over evacuation order". Los Angeles Times. Retrieved 16 August 2015. ^ "China: Tianjin port explosion death toll rises to 121". The Indian Express. 22 August 2015. Retrieved 25 August 2015. ^ a b Phipps, Claire; Weaver, Matthew (13 August 2015). "China blasts: fireball from Tianjin explosions injures hundreds and kills at least 44 – latest updates". The Guardian. Retrieved 13 August 2015. ^ "China explosion: Drone footage shows Tianjin blast site". BBC News. 13 August 2015. Retrieved 14 August 2015. ^ "At least 17 dead as huge warehouse blasts hit Chinese port". CNSNews.com. Associated Press. 13 August 2015. Archived from the original on 13 August 2015. Retrieved 13 August 2015. ^ "Large Explosion Burns 8,000 Cars in China". Auto Guide. 13 August 2015. Retrieved 13 August 2015. ^ "Tianjin explosion destroys over 8,000 new cars in China". Digital Trends. 14 August 2015. Retrieved 17 August 2015. ^ "107页调查报告详解天津港爆炸事故真相-搜狐". mt.sohu.com. Retrieved 28 March 2016. ^ "EventWatch 2015 Annual Report | Resilinc". Resilinc. Retrieved 4 May 2016. ^ a b c d "China's Response to the Tianjin Explosions". The Atlantic. 17 August 2015. Retrieved 17 August 2015. ^ 网易. "津滨轻轨地铁9号线受损严重- 展开抢修 尽早恢复运营" (in Chinese). Retrieved 16 August 2015. ^ "Supercomputer Tianhe-1A shut down due to Tianjin blast". Xinhua News Agency. 12 August 2015. Retrieved 12 August 2015. ^ Vivienne Zeng (18 August 2015). "3,000 tonnes of dangerous chemicals were stored at Tianjin explosion site, say police". Hong Kong Free Press. Retrieved 18 August 2015. ^ "Searching Questions Asked in the Aftermath of the Tianjin Blasts". Time. 14 August 2015. Retrieved 18 August 2015. ^ a b c d "Tianjin explosions: sodium cyanide on site may have been 70 times allowed amount". The Guardian. 16 August 2015. Retrieved 16 August 2015. ^ "爆炸现场下午将降雨 700吨氰化纳遇水生剧毒" (in Chinese). Retrieved 14 August 2015. ^ a b "Tianjin Death Toll Climbs as Crews Scramble to Clear Site of Chemicals". NBC News. 16 August 2015. Retrieved 16 August 2015. ^ "爆炸物主要为硝酸类化学品，下水沟里检出氰化钠" (in Chinese). Sina Corp. Retrieved 14 August 2015. ^ ck 13465. "媒体：天津爆炸现场下水沟检出氰化钠 说明已经泄露" (in Chinese). Retrieved 14 August 2015. ^ Varghese, Johnlee (18 August 2015). "Tianjin Aftermath: 'Chemical Rain' Leaves Streets Foaming, Residents Complain about Rashes". The International Business Times. Retrieved 24 August 2015. ^ Phillips, Tom (20 August 2015). "Chinese authorities investigate mass fish death near Tianjin explosion site". The Guardian. Retrieved 24 August 2015. ^ "CNN, local Chinese media struggle to report on Tianjin explosion". 13 August 2015. ^ "Tianjin detects harmful air pollutants, Beijing stays clear". China Daily. 13 August 2015. Retrieved 14 August 2015. ^ "Timeline of Tianjin explosions". Shanghai Daily. 13 August 2015. Retrieved 14 August 2015. ^ a b "China explosions: Chemical specialists sent to Tianjin". BBC News. 13 August 2015. Retrieved 14 August 2015. ^ "China explosions: More than 6,000 displaced, in temporary shelters after Tianjin blasts". ABC News. 15 August 2015. Retrieved 16 August 2015. ^ "China Tianjin blasts: Evacuation of residents ordered". BBC News. 14 August 2015. Retrieved 14 August 2015. ^ "Chinese police arrest 12 in Tianjin blast probe: Report". CNBC. 26 August 2015. Retrieved 27 August 2015. ^ "China Jails 49 Over Deadly Tianjin Warehouse Explosions". NPR. 9 November 2016. Retrieved 9 November 2016. ^ Wertime, David (13 August 2015). "Four Questions Chinese People Want Answered After Deadly Tianjin Blast". Foreign Policy. Retrieved 13 August 2015. ^ "《津晨播报》 20150813_津晨播报_视频_央视网". CNTV. 13 August 2015. Retrieved 16 August 2015. ^ a b c Cheung, Eric (13 August 2015). "CNN, local Chinese media struggle to report on Tianjin explosion". Hong Kong Free Press. Retrieved 13 August 2015. ^ a b "China silences netizens critical of "disgraceful" blast coverage". BBC News. 13 August 2015. Retrieved 13 August 2015. ^ Hanrahan, Mark (13 August 2015). "Tianjin Explosions: National Disasters In China Prompt Wave of Media Censorship". International Business Times. Retrieved 13 August 2015. ^ "Accountability in China. A blast in Tianjin sets off an explosion online". Economist. 18 August 2015. Retrieved 20 August 2015. ^ "Media Directives on Tianjin Port Explosions". China Digital Times. 15 August 2015. Retrieved 16 August 2015. ^ "China's Censors Scramble to Contain Online Fallout After Tianjin Blast". The Wall Street Journal. 14 August 2015. Retrieved 16 August 2015. ^ a b Custer, C. (13 August 2015). "Chinese authorities clamp down on Tianjin explosion tweets". Tech in Asia. Archived from the original on 14 September 2015. ^ Bodeen, Christopher (13 August 2015). "Death toll rises to 50 in massive blasts at Chinese port". Associated Press. Archived from the original on 15 August 2015. ^ a b "AUTHORITIES SUPPRESS 'RIGHT TO KNOW' ABOUT TIANJIN EXPLOSIONS". Reports Without Borders. 18 August 2015. Retrieved 23 August 2015. ^ "China Shutters 50 Websites For 'Inciting Panic' Over the Tianjin Disaster". Time. 17 August 2015. Retrieved 17 August 2015. ^ "'方圆一公里无生命迹象'？谣言！" (in Chinese). Sohu. Retrieved 18 March 2016. ^ "网信办查处50家涉天津爆炸谣言网站" (in Chinese). Sina Corp. Retrieved 18 March 2016. ^ "Websites punished for spreading rumors about Tianjin blasts". I Cross China. 16 August 2015. Retrieved 16 August 2015. ^ "传播涉天津港爆炸事故谣言 逾300微博微信号被查处 (Chinese)". iFeng. Retrieved 18 March 2016. ^ "Emotions run high at Chinese hospital after blasts". CNN. 13 August 2015. Retrieved 13 August 2015. ^ Zeng, Vivienne (18 August 2015). "Journalist's diary highlights difficulties in reporting Tianjin blasts". Hong Kong Free Press. Retrieved 18 August 2015. ^ Zheping Haung (13 August 2015). "Pick your poison: The firm behind huge explosions in Tianjin handles all manner of hazardous chemicals". Quartz. Retrieved 15 September 2015. ^ a b c Haas, Benjamin (18 August 2015). "China's disaster playbook falls short in Tianjin blasts". Hong Kong Free Press. Retrieved 19 August 2015. ^ "Top executives detained as China investigates Tianjin warehouse blasts". CNN. 18 August 2015. Retrieved 18 August 2015. ^ Macauley, Richard (19 August 2015). "Chinese state media's surprising suggestion for Tianjin blasts: actually tell people what's happening". Quartz. Retrieved 25 August 2015. ^ "Tianjin Homeowners Tell of Compensation Pressure". China Digital Times. 11 September 2015. Retrieved 12 September 2015. ^ Hernández, Javier C. (4 September 2015). "Weeks After Tianjin Blasts, Many Residents Await Compensation for Damaged Homes". The New York Times. Sinosphere. Wikimedia Commons has media related to 2015 Tianjin explosion. "Huge explosions rock Chinese city", The Telegraph (video), UK, 13 August 2015 . Ruihai Logistics (official site) (in Chinese), archived from the original on 12 August 2015 . Panoramic view of Ruihai Logistics, QQ Maps Street View, retrieved 18 March 2016 .